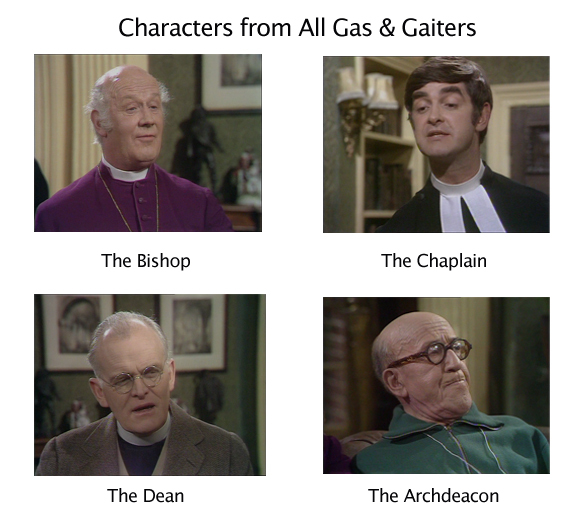 From the Archive: A British Television Blog: All Gas & Gaiters: It Deserves Better! All Gas & Gaiters is a funny series. It’s not one that I will burst out laughing with every joke and it won’t be one that I will remember all the lines or even recite the lines. 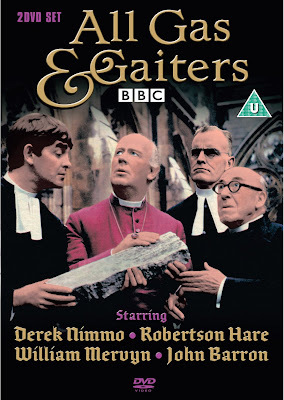 It’s a good solid comedy which is very consistent with the series coming out of the BBC at the time. Don’t get me wrong, even if I am not bursting lavish praise upon the series it doesn’t mean I don’t like it. The thing I keep thinking of is that this series deserves so much better than what it got. Back in 2010 I wrote an article about the first 2 episodes of the series. If I may be so bold, I thought it was a pretty good article. I went into a great bit of detail about how the series was created. I spoke about the concept of The Comedy Playhouse and went into that sad subject of how a great deal of episodes of this series is missing. It’s important to talk about because I think this is one of a zillion great examples of the waste of material and profit the BBC could have been making because this series is all but wiped. I am not one of those nutters who are angry with the BBC for destroying its episodes. It was an appallingly disappointing practice but there are reasons for why it was done. The problem was that I believe this series was destined for better things than what it got. In the previous article I spoke about how this series would have been exported to the US and ran on PBS if more episodes existed. For this article, I watched 2 episodes from the fifth and final series and it just solidifies my belief in why this series needed to be treated so much better. The Bishop is talking with Noote about how he was once invited to lunch with the Queen. Right before he was able to have that lunch he fell ill and couldn’t make it. He was never invited back. Noote has a crush on Princess Anne. He cuts out pictures of her from the newspaper and adds it to his own scrapbook. Regardless the Bishop is still a little sore that he was never invited back which makes it more painful when the Dean comes in let the Bishop know that he is going to Windsor to deliver a sermon. The Dean wants the Bishop to cover for him Sunday while he is away. The Dean also received a motorized lawn mower as a gift and is mowing, mowing and mowing until he hits the root of the Bishops tree in the Bishop’s yard. It breaks the mower blade. 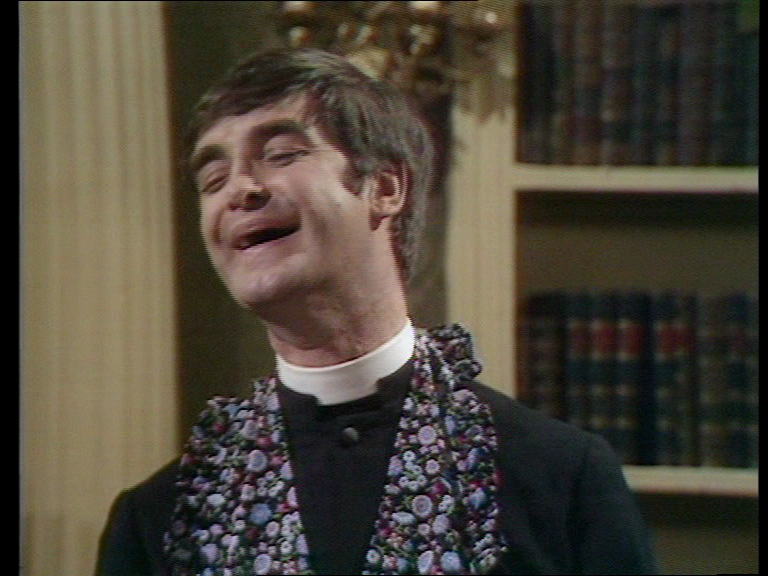 The Bishop is thrilled as he doesn’t have to hear the noise of the mower anymore. The Dean wants to cut down the tree and this created a big fight between the Bishop and the Dean. The Bishop is stubborn and the Dean is just plain rude. Finally, the Bishop thinks he could get his way by allowing the Dean to cut down the tree. The Bishop thinks that the Dean going to Windsor would be able to put in a good word with the royalty about him or even allow him to come along. What the Bishop knows and the Dean doesn’t know is that the tree is dead anyway so it really doesn’t matter. The Dean comes over to cut down the tree and stands on one of the branches of the dead tree. The branch breaks and the Dean falls. He badly sprains his ankle. He is in a ton of pain. It’s kind of odd that we see a program where someone in the Bishop’s position allows the Dean to do something so dangerous and honestly really doesn’t care when he gets hurt. In fact, Noote even reminds the Bishop about it but he does absolutely nothing to warn the Dean. That actually is the funny part. 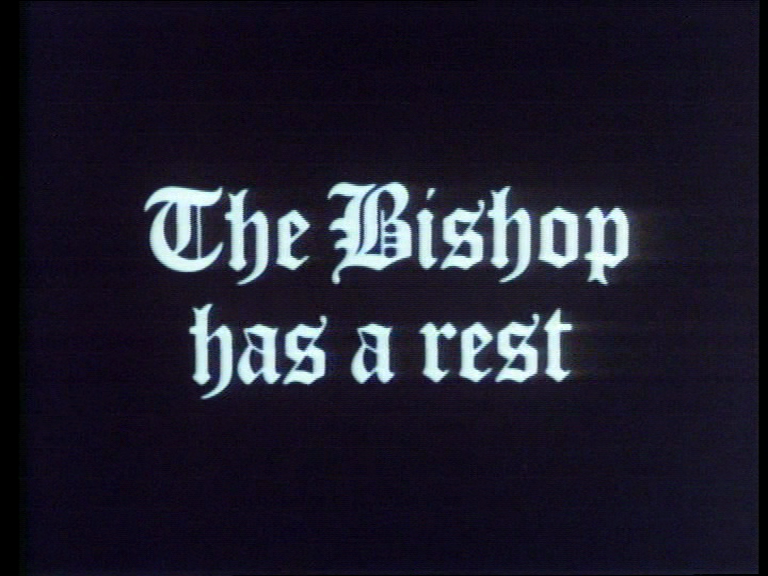 The Dean is in no shape to go to Windsor to deliver his sermon so the Bishop happily takes his place. The only problem is that the Dean’s trip is not to Windsor palace but just Windsor. The Bishop has some very specific views on the Methodist split. The sermon the Dean was going to give was about that subject but with an opposing view to the Bishop’s. The Bishop ended up at Windsor Methodist! 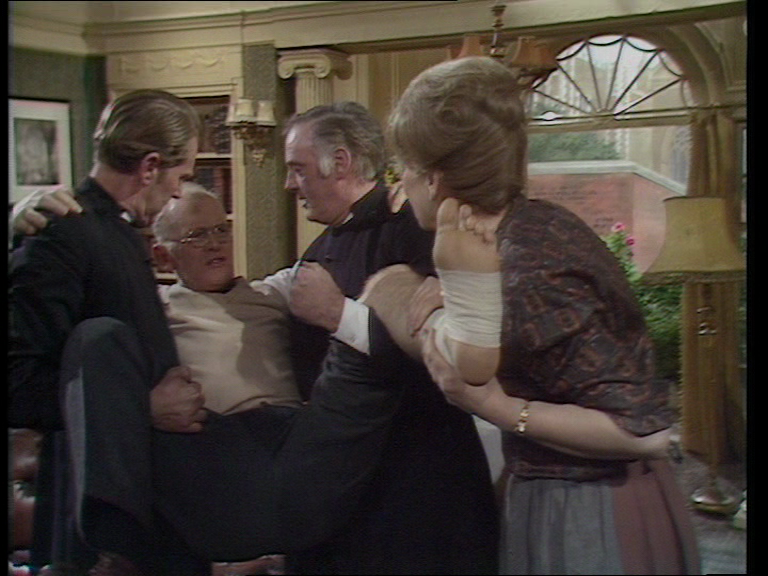 One of the great parts of this episode comes from the supporting cast which is made up of one Joan Sanderson. She is one of those great British actresses who is so much more than the “crabby old woman.” Of course she did play a crabby old woman in the episode of Fawlty Towers called Communication Problems. In All Gas & Gaiters, she plays the very faithful and supportive wife to the Dean. 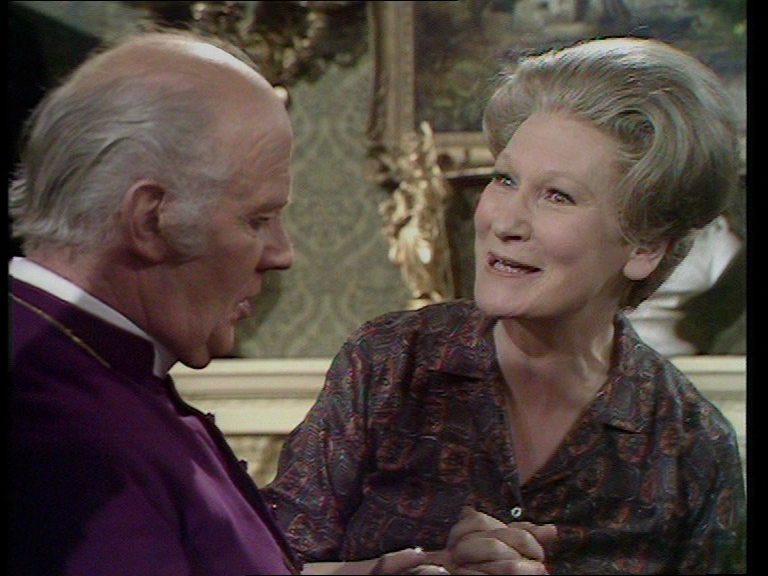 She wasn’t the first person to play the role of the Dean’s wife or otherwise known as Mrs. Pugh-Critchley. That role originally was played by Ruth Kettlewell in Series 1-3. 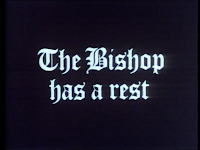 In this episode we see how lazy the Bishop and the Archdeacon are on a Saturday, though frankly I think this is an everyday occurrence. The two men just enjoyed a nice Saturday afternoon meal but have no desire at all to help Noote clean up the dishes or the kitchen. In fact, they make excuses that they must meet to discuss important church business while Noote does all the cleaning up. Church business include such pressing agenda items as the Archdeacon bringing over small pillows so when they lie back in their chairs their heads can rest gently on the pillow. Suddenly, the bells of St. Oggs start going off. The bells have not rung in years, even before the current Bishop took over the church. It is the Dean. He wants to start a small group that will play the bells prior to mass. Church bells playing from a church tower is quite nice but the Bishop wants nothing to do with it. He wants his restful Saturdays undisturbed. The Bishop is immediately relieved when he finds out that this new little group will only perform for a half an hour prior to the Sunday service. After the Bishop agrees to this, the Dean throws a bit of a curve ball. Yes, they only perform for a half an hour prior to service but they will practice for 3 hours every Saturday afternoon. 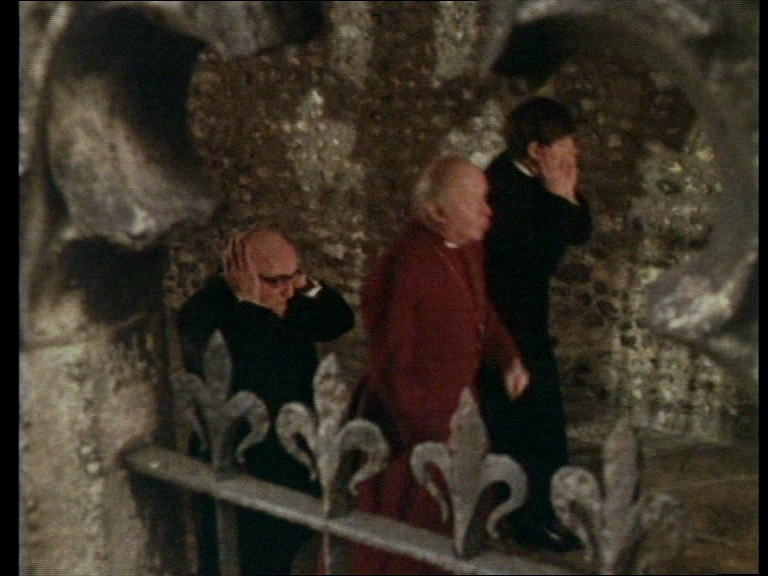 The large amount of noise will drive the Bishop and the Archdeacon mad. One thing that Noote reminds the Bishop about is that there is a reason why the bells cannot be played at St. Oggs. The tower is unsound and will crack. Noote knows this because it is in an old song about St. Oggs. Armed with this ammunition, the Bishop interrupts the practice at the church and keeps trying to tell the Dean that the reverberation of the bells will cause the tower to collapse. The Dean counters with letting the Bishop know that he had an architect in to make sure the building was safe. There is something intersting about the system of the church back then and I am not sure if this is still the case today. If you are wondering why the Dean is just going ahead to do what he wants in the church, it’s because he has every right to do so. In the church, the Dean is responsible for the building and the grounds whereas the Bishop is in charge of the clergy. That is where the separation lies. 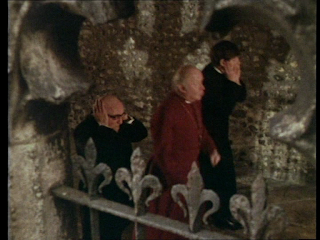 As soon as the practice begins again for the bells, the Bishop notices a great big crack in the wall and interrupts practice for the Dean yet again. When the Dean sees this he freaks out and calls the architect. After he leaves, Mrs. Pugh-Critchley realizes that it’s not a crack at all but a great big cobweb. Back when the Bishop is home, the Dean stops by to let him know that although the church was sound, the Dean’s house adjacent to the church wasn’t and the reverberation from the bells could do more damage to the house. Even though the Dean cannot play the big bells in the tower, he has decided to keep the group going by playing hand bells. Before the Bishop knows it, the group is practicing in his house. The Bishop and the Archdeacon take the attitude of if you can’t beat them, join them. Like I mentioned above, the comedy really isn’t uproarious laughter but the comedy is softer and very enjoyable. 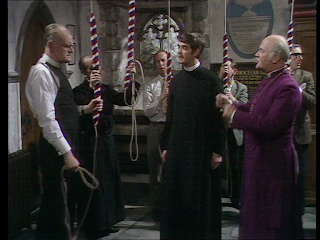 In The Bishop Has A Rest, the Dean is explaining to the Bishop about how he and his wife are going at it practicing the bells. 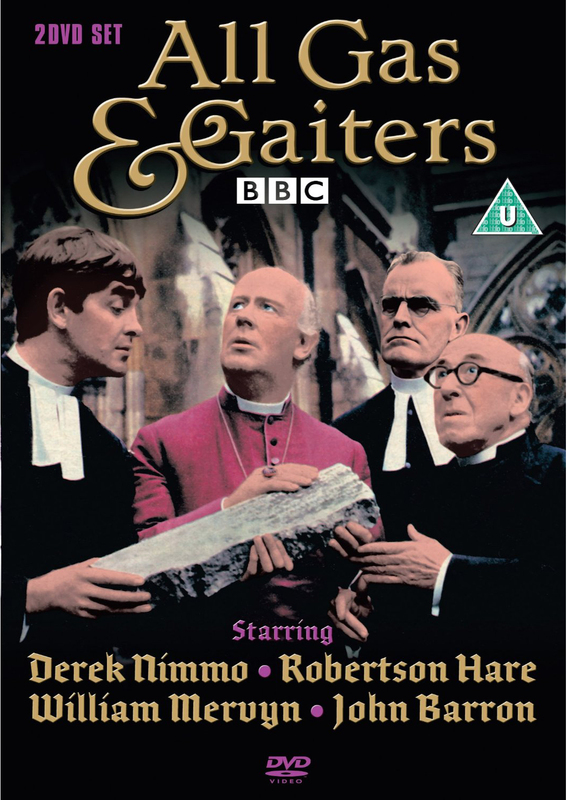 The Archdeacon comes in and mistakes the discussion as if the Dean is talking about how he and his wife are making love. Perish the thought! The Archdeacon nearly loses it when the Dean expresses how they want to do this in public on a Sunday in church! The Dean, played by the wonderful John Barron, is so awkward; it is hard to see how he could be friends with anyone or even married! If he does have friends, do they call him Bunny? 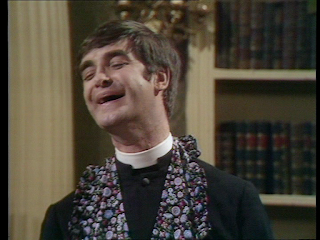 William Mervyn is the Bishop who, to me, plays it a bit pantomime but that what gives him great character. Derek Nimmo as Noote is not nearly as dumb as I think he originally played it. 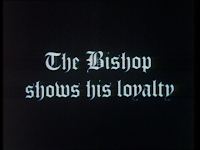 In fact, his knowledge of certain things in these episodes such as the dead tree in The Bishop Shows His Loyalty and the bell issue in the tower in this last episode really progresses the plot of the episodes. 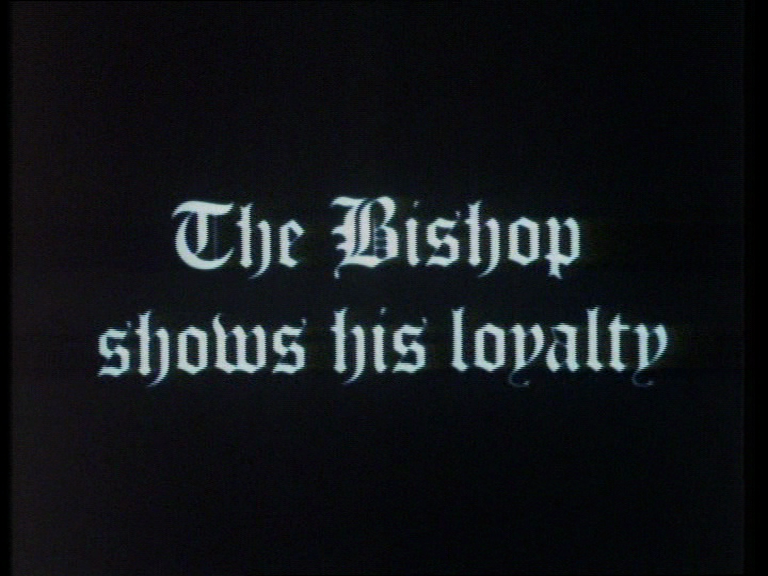 Most of the plot is focused between the Bishop and the Dean. At this point Pauline Devaney and Edwin Apps who wrote the series were getting great feedback from viewers. At first, many wondered if having a comedy in the church was going too far. Then, as time went on Devaney and Apps were getting letters from clergy members explaining that’s how life really is in the church. The one thing I noticed about this series when I started to think more about it was that we never see or hear anything from the congregation. It’s always some kind of situation and battle between the Bishop and the Dean. There never is a member of the “flock” who tells the Bishop how to run things. There isn’t a busybody or a Mary Whitehouse kind of character. I think that’s part of the charm. It’s more of an internal battle than including members of the public. It wouldn’t work if the Bishop had any problems with people who were directly part of his congregation. Even though they argue with each other a lot, there are still loveable characters. This is why I think this series would have been perfect for PBS. Not that PBS is the end all be all of broadcasting but I am thinking about viewers over here in the US who will never see this series. Even in the UK, it’s not exactly easy to see this. I had been curious about this series for years only to see that the existing episode had been released on DVD. I noticed this just by chance. At the time the DVD was out of print but it looks back in now. If more episodes existed and were exported to the US, I think a lot of people would enjoy it and it would easily be fondly remembered over here in the US. I think it easily fits into the same type of comedy as Dad’s Army or even Last of the Summer Wine. There are some gentle similarities that are echoed in Bless Me Father too. The 11 episodes that make up this set are a mixture between black & white and colour. There has been no work done to any of the episodes. In fact, the title sequence for the episodes I watched looked like the film was run through dirt first. It looks horrible. Horrible is being nice! Also the video quality is faded and soft. It is clear no DVNR was applied to these episodes. Surprisingly, I am fine with that. As much as I love stuff to be restored, I would rather have them available to watch rather than not available at all. Just like Devaney and Apps, I prefer the black & white episodes over the colour ones. It feels better suited to the series in black & white. This is not a series I think everyone will like. That is not because it has to do with it being a comedy set in church but more because the comedy is pretty simple. It’s not hilarious but funny. Then again, does it have to be hilarious? No, it just needs to be enjoyable to make it good. Let the interesting and likeable characters do the rest. What can I say? I have never seen any of this, so I am familiar only in passing by name and reputation. It is one of those that sits in the back of the mind and never pushes forward when purchasing DVDs.There is always something more pressing to buy so it just never gets a chance. Perhaps one day, but who knows. I probably would like it -maybe I should leave it at that. I look forward to an article on Dad's Army, and to the article on the unnamed comedy set during World War II - I wonder what it could possibly be. As much as I enjoy All Gas & Gaiters, I would wait for a better price. On the back of the release it says, "One Big Fat Chuckle!" as a form of a review. I think that sums it up nicely. Don't get me wrong, I'm glad I have this but I think I paid closer to £6.